RFB. With stock necklace, top and coat only, plus an Azone Jeans, no shoes. Come in original box with stand. Excellent condition, no loose joints. Purchased on Nov 2007. US$93.00 before shipping. MINT in box with stand, no clothes (rude!). Doll in perfect condition, $20AUD purchased April 2006 (might have been a month or two later can't remember). 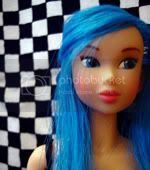 What do you think a good price would be for a mint doll with partial stock? I'm missing her dogtags and black tank.